Unheard Bounty On Mobb Deep's First Album In Eight Years : The Record After an eight year absence, the release of a new Mobb Deep album would be notable enough, but it's the bonus disc of previously unheard sessions for The Infamous that send this package over the top. Under most circumstances, the release of a new Mobb Deep album would be notable in and of itself. 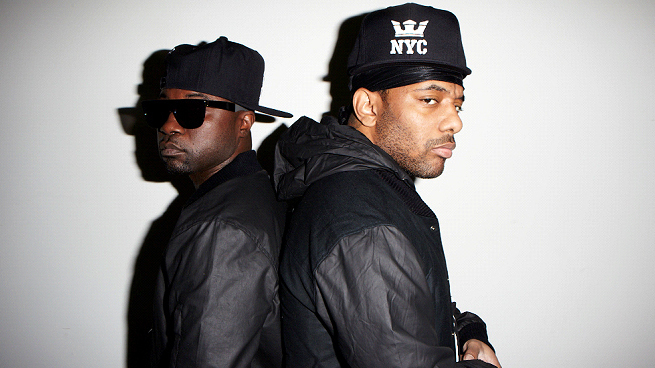 This veteran rap duo from Queens had a short-lived but very public falling out in 2012, casting any future collaborations into question; as it is, their new The Infamous Mobb Deep is the group's first joint project in eight years which, in rap years, might as well be eighteen years. The new album's title is, of course, a nod to the group's most lauded release: 1995's The Infamous. That album ranks amongst the greatest sophomore efforts in hip-hop history in terms of how it remade our idea of Havoc and Prodigy, taking them from gimmick-ish "kid rappers" in 1993 to adult purveyors of urban pulp on par with Nas, Biggie, the Wu-Tang Clan, etc., two years later. When Eminem used that album's hit single, "Shook Ones, Pt. II" as his sonic draught of courage in 8 Mile, he wasn't "immortalizing" it — the song already had that stature — he was merely paying homage. The point being: The Infamous was a Very. Big. Deal. It's a risky proposition to name a new album after a seminal release from the past. It sets expectations impossibly high and even in those cases where the sequel is decent, it's unlikely to ever reach the same stratosphere as its progenitor. See Nas's Stillmatic (2001) or Raekwon's Only Built 4 Cuban Linx... Pt. II (2009) — both embraced by fans, though no one would ever confuse either for lllmatic (1994) or Only Built 4 Cuban Linx... (1995). The Infamous Mobb Deep could have fallen into the same category. That's not to say its 13 new songs are underwhelming; much of it is quite good. There's an edge of age and weariness in both Havoc and Prodigy's voices now, but it adds gravitas, like elder gangsters dispensing stoop wisdom. Some tracks, especially "Get Down" and "Murdera," are classic Mobb Deep: hyper-violent imagery set to blood-chilling, paranoid scoring. However, much of the album is a vintage blend we've sampled before; it's not genre-altering in the way the original The Infamous was (and to be sure, it's not even certain what "genre-altering" would look like in hip-hop these days, considering how broadly its styles have been stretched into other genres, from country to EDM). Yet, what elevates The Infamous Mobb Deep from "acceptably listenable" to "truly remarkable" is the "bonus" disc that's paired with it: 14 skits and songs rescued from the vault, dating back to the 1994-5 studio sessions for The Infamous. This includes alternate verses, beats, guests and entire songs that never made the final cut of The Infamous. These are not scratchy, lo-fi demo tracks. Many of them sound as if they were a couple of mixing or mastering sessions from release. They've been hinted at in the past, but this is the first time anyone outside of the group's camp has heard many of these tracks. For all these reasons, and especially for nostalgia-crazed fans of the so-called "golden era" of '90s hip-hop, this bonus disc is easily one of the greatest releases of its kind. Take the very first song from that second disc: an alternate version of "An Eye for an Eye," one of the most lauded tracks from The Infamous, featuring guests Nas and Raekwon at the height of their lyrical prowess. On the bonus version, not only is there a previously unreleased Ghostface verse but — with the exception of Nas — everyone else on this alternate take is rhyming with new verses. The beat is also notably different, using an Al Green loop that was eventually jettisoned in favor of a sparser — and darker — track for the final cut. Likewise, the bonus disc's "Gimme the Goods" is the group's jaunty original track, which bears no resemblance to the smoother, jazzier Infamous version (entitled "Give Up the Goods") produced by A Tribe Called Quest's Q-Tip. There are also half a dozen never-released songs including the atmospheric, "Get It In Blood," two versions of the dramatic "The Money," plus "The Bridge," an ode to Mobb Deep's Queensbridge roots. Altogether the bonus disc is a bounty with few peers. As the Guardian's Angus Batey noted in 2010, when it comes to hip-hop, "unreleased material may be hard to find, and impossible to license, if it even exists." Exceptions exist here and there but generally in smaller quantities or poorer quality. Very few labels, let alone artists, practice due diligence in preserving original session tapes so the fact that these recordings even survived the last 19 years is remarkable enough. That the group would opt to share them with the public in this quantity is an astonishing extra. On that note, without trying to look that proverbial gift horse in the mouth, the only disappointment is that the liner notes don't offer more details about the provenance of these alternate versions. They are, by themselves, evidence of the group's creative process, ideas formed and eventually abandoned, but we don't hear enough from Havoc and Prodigy themselves as to how they made those crucial decisions. To help fill in some blanks, I called up the group's A&R at the time, Matteo "Matty C." Capoluongo, and he revealed that this new album's bonus material is only a fraction of what's out there: "We did many takes of different songs: different verses, different beats." According to Capuloungo, Mobb Deep's label then, Loud Records, booked the group for an extraordinary amount of expensive studio time, allowing them to play with a range of lyrical and musical ideas, all with tape rolling. As The Infamous formally turns 20 next year, maybe the group can prep Even More Infamous and give us further peaks into their potent past.